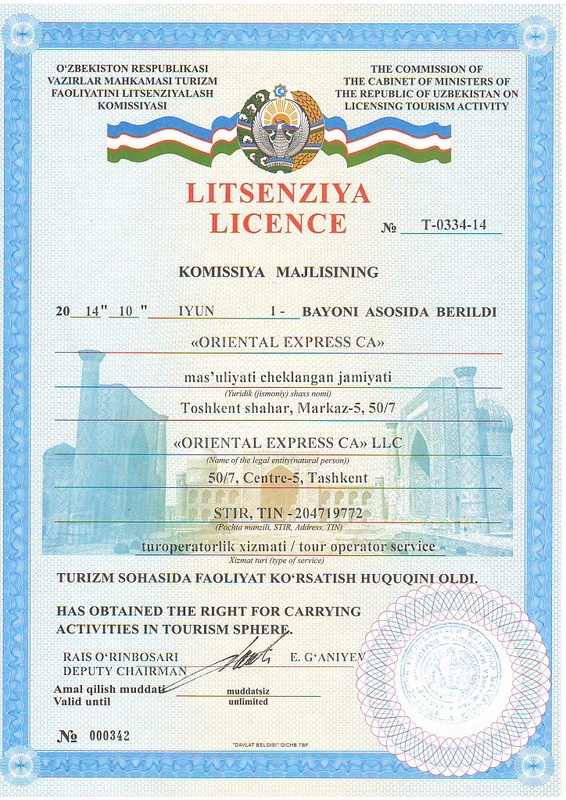 Limited liability company "Oriental Express CA", hereinafter referred to as "Executor", acting under its Charter, License # 037-04 and Certificate of Compliance of Services # 001794 offers touring services to any legal entity or private person, hereinafter referred to as "Customer". 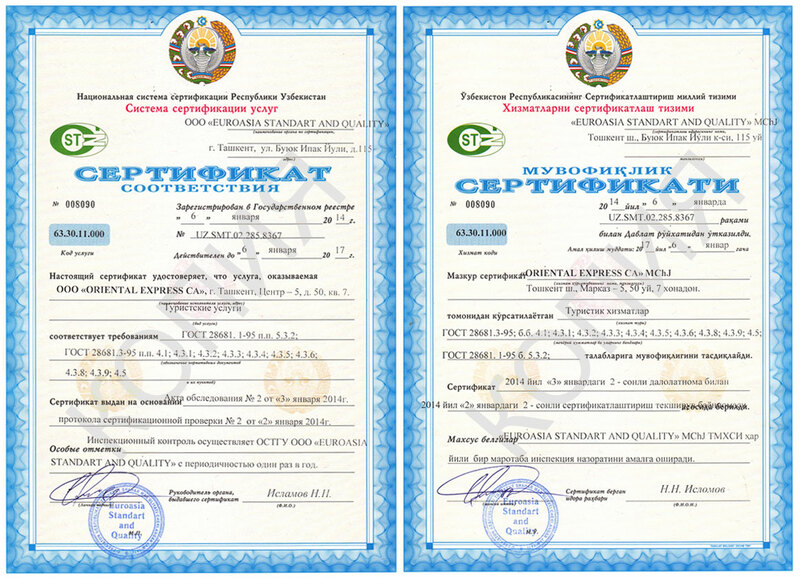 As per Article 370 of the Civil Code of the Republic of Uzbekistan (CCUz), conditions of this Public Offer (hereinafter referred to as Agreement) are deemed unconditionally accepted when Customer makes payment for the Services and Executor receives the appropriate financial document confirming the payment. 1.1 Executor provides Customer with paid touring services at their request. Request is submitted by the Customer in accordance with the list of services provided by the Executor and published at the website www.OrexCA.com. Booking of services is confirmed by the Executor by providing Proforma Invoice for the services. 1.2	Customer provides all data required for booking of touring services and a booking form. Payment made by the Customer for the Services and receipt of the appropriate financial document confirming the payment by the Executor confirms unconditional acceptance of the conditions of this Agreement by the Customer. 2.1	Provide services paid for by the Customer and confirmed by the Executor, according to the list, provided at the website, at the day of submission of the Request Form. 2.2	Provide Customer with all the documents required for provision of the Services. 2.3	Provide Customer with unbiased information on the services being provided, insurance conditions and other information required for servicing. 2.4	In case of nullification of the order, to return the amount paid for the services as stipulated under the Item 5.2 of this Contract. 2.5	Provide Executor with all information necessary to complete the paperwork required for provision of services by filling out the Request Form provided in the website. 2.6	Pay for the services ordered and confirmed for provision by the Executor within three days from the day of receipt of the Proforma Invoice. Provide Executor with documents confirming the payment. 3.1	Customer makes payment against the Invoice received from the Executor within three days and provides Executor with document confirming the payment. 3.2	In case the payment doesn't reach the account of the Executor, this latter has a right to strop provision of the services. 4.1	Arguments arising from execution of the Agreement are settled by the virtue of negotiations, or in accordance with the existing Law of Uzbekistan. 4.2	Travelers that arrived late for the start of the Services, do not receive any compensation from the Executor. 5. Conditions of nullification and reclamation. 5.1	If the Customer arrives late, they are guaranteed to receive the services (be signed in the place of residence) if they arrive within one day from the date and time of arrival indicated in the booking confirmation. Payment for the services that were not provided because the tourist was late is not to be compensated. 5.3	If the Customer has a profound claim (reclamation) against the quality of touring services purchased from the Executor, the Customer shall immediately inform such claim to the Executor. In this case, representative of the Executor, together with personnel of the site that is directly involved in provision of the service (providers of accommodations, transport, memorials being visited, tour guides, etc) act to eliminate the reasons of the claim and resolve the conflict. 5.4	In case the Executor can not provide the Customer with confirmed services, the Executor must provide the travelers with services of the category that is equal or higher than the ordered one (category criteria is the price of the service) or compensate the Customer for the proved costs related to the change of the service plan, including compensation in accordance with agreement of the Parties or in accordance with existing Legislation. 6.1	This Agreement enters into effect starting from the day when the Executor receives documents confirming the payment made by the Customer for the services confirmed by the Executor, and it is terminated on the last day of service of the Customer as stated in the confirmation of booking of services.